“With over twenty years experience in Theatrical Mime and theatre, Lorin Eric Salm brings an approach to the art little known in the United States. He views Mime as a theatrical art, using the magic of illusion and the power of silence to create comic and dramatic physical performance for the stage. His style transforms Mime into a profound dramatic art that speaks through movement and attitude, geometry and poetry. He makes the invisible visible, and with the body touches the soul. A native of Los Angeles, Lorin moved to Paris, France, where he studied under the world-renowned master of Mime Marcel Marceau. He is a 3-year graduate of Marceau’s Ecole Internationale de Mimodrame de Paris (Paris International School of Mimedrama), and has studied with former assistants of the French creator of Corporeal Mime, Etienne Decroux, as well as others including the Polish master Stefan Niedzialkowski. Lorin has performed in Paris both with Marcel Marceau and in his own one-man show That is to Say . . . , as well as in Israel, New York, Las Vegas, Los Angeles. In May 2006, he represented the United States at the Second International Pantomime Festival in Shefa-Amer, Israel. In the United States, Lorin teaches Theatrical Mime to actors, dancers, comedians, storytellers, and singers (including workshops for Cirque du Soleil); he coaches and designs Mime and movement for film, television, and theatrical productions; and he teaches Mime and character movement skills to animation artists at Walt Disney Feature Animation, DreamWorks Animation, and Sony Imageworks, and to animation students at California Institute of the Arts and Bridges Institute of Visual Arts . In 2001, Lorin founded Mime Theatre Studio in North Hollywood, California, where he currently teaches year-round workshops. 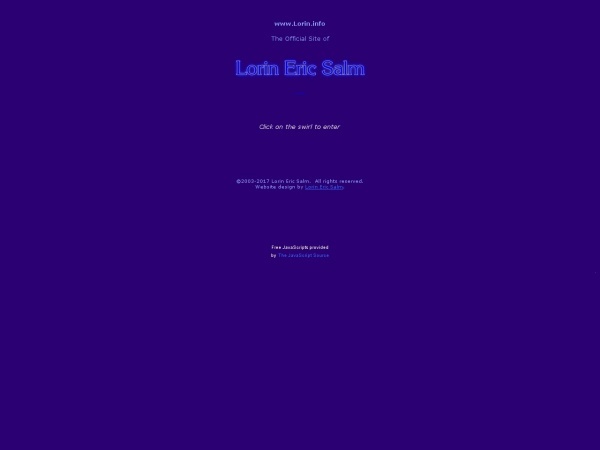 Lorin Eric Salm has become a world resource for the international Mime theatre community by his authorship and administration of The World of Mime Theatre, the acclaimed website that, compared to available online resources, Encyclopedia Britannica’s Internet Guide called the “”definitive source on mime as a theatrical art.”” Lorin also serves as editor of several Mime categories for the Internet’s Open Directory Project. His efforts continue to further international appreciation of Theatrical Mime, and have earned him the recognition of Mime professionals and enthusiasts around the world.